• An IASCA branch was opened in cooperation with Queen Rania's Center for Jordanian Studies and Community Service at Al Yarmouk University on the October 27,2011, under the patronage of Dr. Talal Abu Ghazaleh, Chairman of IASCA, in the presence of Dr. Abdullah Al Mousa, President of Al Yarmouk University, Mr. Khaled Abu Zaid Mayor of Irbid and a number of the Governorate Deputies and officials of the banking sector. This branch of IASCA was established to constitute a comprehensive information and knowledge center for all locals from the different provinces of the North, to promote the principles of accounting and auditing, build capacities through providing practical applications and scientific programs that can keep up with the requirements of the business market both at the local and Arab levels. 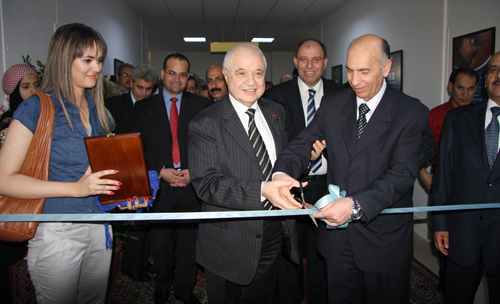 Opening of this new branch, through which all services rendered by IASCA would be provided, constituted an expansion of the main branch of IASCA in Amman. .Promoting the profession of accounting, utilizing it in the various industrial and commercial arenas and applying the international accounting standards for the promotion of this profession.
. Scientific qualification of the accountants of the region in accordance with the highest international standards, in cooperation with Queen Rania's Center for Jordanian Studies and Community Service at Al Yarmouk University, through training programs and conducting professional exams in accounting and financial management, based on which the IACPA certificate issued by IASCA, which qualifies its holder to work in all different Arab countries, shall be granted.